aa".......your work and craftsmanship exceeds anything I have ever seen by a long long way." 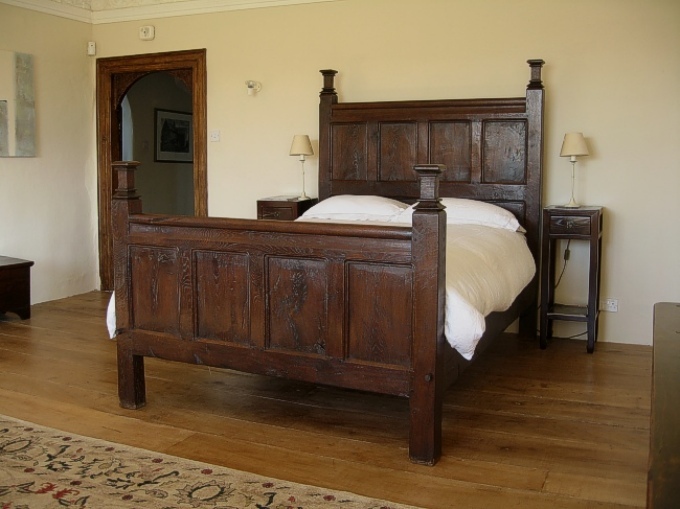 A Panelled Bed, handmade from reclaimed old oak, for our client; a serious and avid collector of early oak furniture. All the components have been cut from carefully rescourced ancient oak beams, using hand held tools, and have been hand planed and hand scraped before assembly. All the mortise and tenon joints are dry fitted and secured by means of tapered oak pegs driven through offset holes, known as 'drawer-bored and pegged', (exactly the same method as 16th century craftsmen used). The framework edges have scratch stock mouldings with hand cut masons' mitres to all four corners, a decorative method used widely during the 1500's. The finials to the top of the footposts and headboard posts were also cut and shaped using hand tools. Old moulding planes were used to fashion the top rails (of the footboard and headboard), into a profile similar to that commonly seen on many ancient church pews. The ornate 17th century plaster ceiling (unfortunately not shown in the photo below), in the bedroom of this wonderful and historically important Devon manor house, is believed to be one of the finest examples in the west of England. Reputedly, Oliver Cromwell slept in this very room. Click on the thumbnails below for more detailed photos.